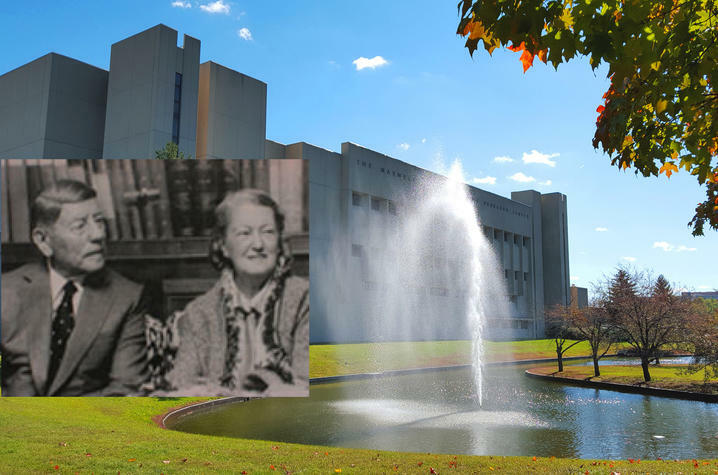 UK's Gluck Equine Research Center (Image of Maxwell Gluck, left, and his wife, Muriel). LEXINGTON, Ky. (Sept. 1, 2017) — The University of Kentucky Maxwell H. Gluck Equine Research Center is celebrating 30 years of legacy service to the equine community worldwide. A 30th anniversary research seminar, open house and celebration dinner will be held on Oct. 12. The seminar will begin at 8 a.m., at the Gluck Center, and will feature the inaugural Teri Lear Memorial Lecture followed by an open house. The dinner will begin at 6 p.m., in the Woodford Reserve Club at Kroger Field. Stuart Brown, chair of the Gluck Equine Research Foundation and Hagyard Equine Medical Institute veterinarian, will host the program honoring Peter Timoney, Gluck Center professor, for his lifelong contributions to equine infectious disease research. "I look forward to this milestone 30th anniversary of the Gluck Center and the recognition of the contributions of Dr. Peter Timoney throughout his career. The Gluck Center is an internationally recognized center of excellence in equine research and discovery for the benefit of the health of horses of all breeds and disciplines,” Brown said. The center opened its doors June 5, 1987, with a promise to fulfill thoroughbred breeder and entrepreneur Maxwell Gluck’s legacy and to continue the research and distinguished service in the Department of Veterinary Science, established in 1915, to the equine industry. Professors in the department were already world-renowned for their important contributions to equine reproduction and infectious disease research. Maxwell Gluck, and his wife, Muriel, pledged a $3 million challenge grant to the university to build a $9 million equine research facility on the condition the state and those in the equine industry match the funds. Kentucky Gov. John Y. Brown Jr. matched the challenge grant with $3 million in state economic development bonds. Other equine industry leaders quickly embraced Gluck’s idea by rallying together to make his vision a reality. UK President Otis Singletary organized a special advisory committee of influential equine industry representatives led by William S. Farish III, owner of Lane’s End Farm, to meet the challenge through a “Support the Foundation” campaign. Farish, along with a group that included John Gaines, owner of Gainesway Farm; James E. “Ted” Bassett III, president of Keeneland; Albert G. Clay, owner of Fairway Farm; and Frederick L. Van Lennep, owner of Castleton Farm, quickly raised more than $4.2 million within a month. “This accomplishment could not have been possible without the vision of many leaders from the equine industry and the University of Kentucky who partnered in this venture 30 years ago and assembled such a distinguished faculty to execute on the strategy of this equine-focused research center,” Brown said. “Today, we recognize the benefit of this investment across the many areas of cutting-edge research performed by our team of faculty members, under the leadership of Dr. Horohov, as we celebrate the legacy of this commitment for decades to follow in support of the mission to improve horse heath and well-being." Today the Gluck Center is part of the UK College of Agriculture, Food and Environment and has 20 faculty members conducting equine research in the areas of genetics and genomics, immunology, infectious diseases, parasitology, pharmacology and toxicology, musculoskeletal science, and reproductive health. Full details about the 30th anniversary events, along with the opportunity to reserve tickets, is available at www.ukalumni.net/gluck.